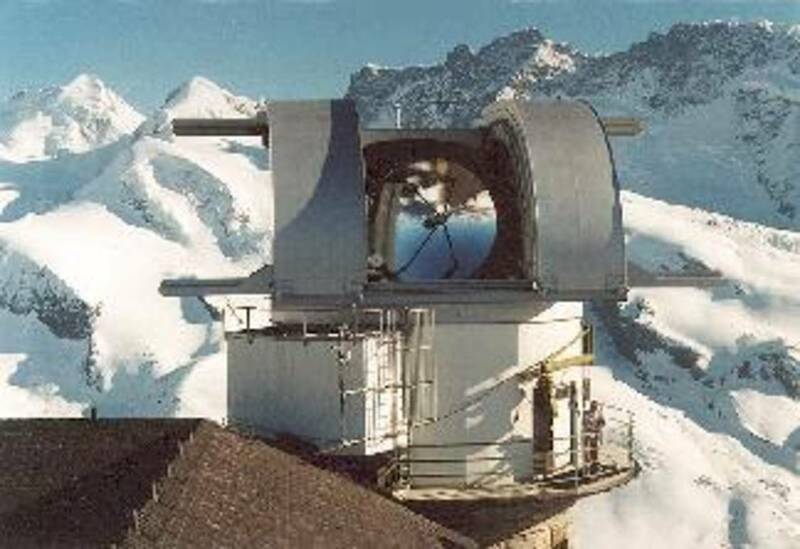 The KOSMA 3m submillimeter telescope on Gornergrat near Zermatt in Switzerland was operated by the I. Physikalisches Institut, Universität zu Köln, and the Radioastronomisches Institut, University of Bonn. It was also supported by special funding from the Land Nordrhein-Westfalen. The observatory was administered by the Stiftung Hochalpine Forschungsstationen Jungfraujoch und Gornergrat, Bern/Switzerland. Because of the good climatic conditions at the altitude of 3135 m (10285 ft), astronomical observatories have been located in both towers of the “Kulmhotel” at Gornergrat since 1967. In 1985, the KOSMA telescope was installed in the southern tower by the Universität zu Köln and, in the course of 1995, replaced by a new dish and mount. In the northern tower, a 1.5 m infrared telescope is operated by an Italian association of universities (TIRGO). The KOSMA telescope with its receivers and spectrometers was dedicated to observe interstellar and atmospheric molecular lines in the millimeter and submillimeter wavelength range. After 25 years of a successful era came to an end (June 2nd, 2010). The 3m KOSMA Radio Telescope left the Gornergrat and joined his long journey to Yangbajing / Lhasa / Tibet. Short radio report in german on Deutschlandfunk-Sternzeit.